Forrest blends our love of surname-names with all things green and growing. Thanks to Annabel for suggesting our Baby Name of the Day. In Latin, forestem silvam refers to the “outside woods.” Forestum comes from foris – the same root as our word foreign. Medieval Latin gives us forestis, a game preserve. Other theories compete, too, like the Germanic forst. Since the word was first recorded during the age of Charlemagne, it’s possible that both are right. It referred to a wooded area set aside for the king, or other nobles, to hunt. Such restrictions led to debates aplenty; the Magna Carta addressed forest privileges, but the debate raged on for decades. Slowly, the concept changed, though. Instead of protected lands, it became a synonym for the woods, a place packed with trees and wildlife. So many surnames refer to places families lived; no surprise that someone living near a royal forest might adopt this as a surname. While we spell the word with a single ‘r’ today, the ‘rr’ spelling seems more common as a surname. We know that an early bearer of the name arrived in the American colonies through the Virginia Company in 1608. Thomas Forrest was a younger son, wealthy enough to be considered a gentleman and investor in the Virginia Company, but without prospects in England. The family became established in the New World. His descendant, Uriah Forrest would serve in the Revolutionary War and later, represented the state of Maryland in Congress. So there are ties to the natural world and the early American colonies, both positive attributes. But then there’s Nathan Bedford, a lieutenant general in the Confederate Army. Not only did the general fight on the losing side of the war, but he went on to become an early leader of the Ku Klux Klan. It’s a strongly negative association, perhaps even a deal-breaking one for some families. Debates about his legacy continue, especially as Southern states grapple with the question of so many Confederate monuments and places named after controversial figures. 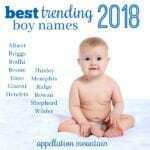 The practice of naming children after military commanders may explain the frequency of boys named Forrest, at least in part. The Civil War ended in 1865. In 1880, the first year for which we have US name data recorded, Forrest ranked #280, with 36 births. The fictional Forrest Gump was named for the general, partly because he’s a distant relative. Though Mrs. Gump also explains her choice this way: Momma said that the Forrest part was to remind me that sometimes we all do things that, well, just don’t make no sense. It’s not clear that he’s seen as a role model of any kind, much less a hero. It’s also the given name of the inventor of M&Ms, a handful of athletes, actors, and other notables over the year. But it’s Gump that really puts it on the map, the main character at the center of Winston Groom’s 1986 novel. Tom Hanks won as Oscar for his portrayal of Gump in the 1994 movie adaptation. Leading men often influence what we name our children. (I’m looking at you, Liam Neeson and Leonardo DiCaprio.) So do characters, like Lincoln and Logan. But Gump isn’t a straightforward hero. He has a low IQ, but significant physical strength and endurance. But what we know him for is unfailing honesty and kindness, wrapped up with a fearlessness when it comes to doing the right thing. In other words? He’s admirable – even moreso in the movie, I think – but he’s not necessarily the way we imagine our children. 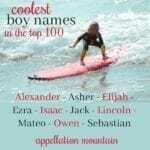 The name probably felt reasonably mainstream circa 1880, far less common than Frank, George, or even Chester, but well ahead of Logan, Axel, Garrett or plenty of other names that seem ordinary today. It charted in the Top 200 into the 1920s, and fell into the 400s by the 1980s. The movie briefly pushed the name way back to #217 in 1994. Another Hollywood connection is Academy Award-winning actor Forest Whitaker. He spells his name with a single ‘r.’ He’s actually Forest Steven Whitaker III. 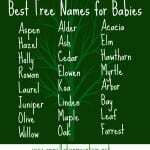 That means that the original Forest probably received his name back when it was far more common – even if the spelling was always the less popular choice. There’s no clear link between Whitaker’s career and the name’s use. In fact, the Forest spelling has failed to crack the US Top 1000 since the 1990s. Today, though, Forrest is climbing back into favor. The name now ranks #596, meaning the name has more than doubled in use over the last five years. What explains it? It’s a preppy hellraiser name, less hippie chic than River, not as buttoned-down as Carter. Forrest sounds like a brother for Wilder or Wells, at home on an Ivy League campus, but also comfortable hiking an out-of-the-way trail in the Pacific Northwest. It’s the kind of name that sounds capable, but also gentle. It feels rooted in tradition, but fresh and new for the twenty-first century, too. Despite all of these positive attributes, it’s still relatively underused. So if you have your heart set on a name that straddles the rugged and the polished, Forrest might be the choice for you. What do you think of Forrest? Does it feel more like a nature name, a surname, or something else? First published on September 8, 2011, this post was revised substantially and re-published on November 14, 2018. One R and the name is perfect – Forest, not Forrest. We just named our son (born in October) Forest (one “R”)! It felt strong and sensitive. 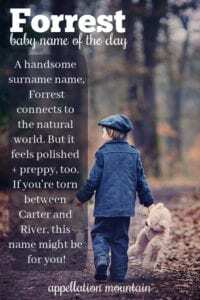 Forest is one of my favorite middle name ideas for a boy. The one ‘r’ spelling is preferred around here (as if to make it clear– the place, not Gump). It’s solid and quietly masculine… a step removed from Spruce or Oakes, more toward Brooks. I like it! Would be delighted with a grandson with the name. Well obviously I prefer Sky, being a male Skye 😀 Forrest is ok I guess, I’m surprised it hasnt returned to the top1000 or Forest. I think River is also a pretty great nature name. I know Leif isnt a nature name, but I associate it immediately with leaves, so it can be nature-y haha! I love Leif, too – I could even like Leaf. It is a shocker that Forrest/Forest is so obscure! Forest Whitaker has a son named Ocean – I like that, too. There’s Oceane, too, which is big in French-speaking Canada … but it is pronounced more like oh SEE ahn – which would just be baffling in the US. Too bad! I know a set of twins named Forrest and Samuel (2 years) and I know a little Ryder Forrest (5 years old.) Maybe it’s popular in my area? Maybe! I love Forrest and Samuel as brothers. Forest strikes every tick in my head for a lovely nature name. Forrest, despite Whittaker, who I am a fan of, is still too stuck as a KKK reference for me. I know it’s quite unreasonable of me but there it is. my loathing of intolerance coming out in weird ways. For famous Forrests there’s also the Rev. Forrest Church. An amazing, amazing man, who, sadly, passed away two years ago this month. He was born Frank Forrester Church IV. My dad has a friend from high school named Forrest. He’s a brilliant, but eccentric journalist and I always liked how his name sounded like a “writer’s” name. My SIL considered Forest, but she couldn’t get past Forrest Gump, maybe this is a name that needs to simmer on the back burner a little longer. Too much associated with Forrest Gump. But Forest, that I could get behind. Forrest Whitaker is one of my first associations with the name; I’m kind of surprised he wasn’t mentioned, especially considering he won a Best Actor Oscar only a few years ago. Anyway, I quite like Forrest. 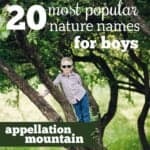 It’s one of the few nature names (for boys anyway) that sounds manages to sound crisp and stately. You’re right, Sarah – and I’ve added him to the post. Thank you! Thanks for catching that Abby! I know Forest Whitaker isn’t that big of an actor, but his performance as Idi Amin was very powerful and unforgettable. I think it sounds cool, but not for me. Another popular one is Forrest Whitaker the actor. It’s the name of my football/soccer club’s rival, which means it’s a big no-no for me (especially since my Grandad told me that we don’t say the F word in our house!). I know a couple of guys my age with the name either first or middle, and a few more who aren’t – they’re all named after the club. […] answering to Cadence and Harmony, perhaps literary terms were the logical next frontier. […] Forrest – Can’t decide on just one tree? […] – Free of Forrest’s preppy overtones and not as popular as River, Cedar is wild, but not too out there.